On the morning of November 21, 1920, eleven British intelligence agents, plus an ex-British Army officer and two British Auxiliary paramilitaries were killed by Michael Collins’ squad in their homes in Dublin. Later in the day during a fund-raising football game between Dublin and Tipperary for the prisoners’ dependents at Croke Park, 15 lorries of military and paramilitaries arrived at the pitch, preceded and followed by two armoured cars. According to spectators at the game, a British officer climbed on top of the wall and fired a revolver shot to signal the start of a period of sustained gunfire from the paramilitaries. The crowd thought at first that the raiders were firing blanks, but then the British aimed machine gunfire at some of the crowd. 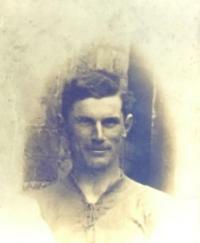 The crowd stampeded and one of the first to be killed was Tipperary player, Michael Hogan. In all fourteen civilians were killed including Jane Boyle, who was due to be married five days later, fourteen-year-old John Scott, who was mutilated when found, and two others who were 10 and 11 years respectively. Lár na Páirce has a special display related to Bloody Sunday, the name by which the day is remembered. Most of them centre around Michael Hogan, the best known of the casualties from Grangemockler, County Tipperary, the only player to be killed on the day, and after whom the premier stand in Croke Park was named in 1925. The mementoes include a framed picture of the player as well as a picture of the team that played Dublin on the day. There is also a replica jersey worn by Michael Hogan. At the time county teams wore the colours of the county champions and Grangemockler held that honour at the time. The result was that the Tipperary team wore the Green and White of Grangemockler on the day. Another memento is a copy of the ticket for the game. The price of admission was one shilling, equivalent to about 4 cents today. The game was advertised as the Great Challenge Match, Tipperary versus Dublin, with the Tipperary name coming first on the ticket. The day was remembered for many years with a match between Dublin and Tipperary, with the venue alternating between the two counties. There was a special commemoration at Grangemockler on the 75th anniversary and a comprehensive booklet about the event was produced by South Board secretary, Micheal O’Meara, for the occasion. It is included among the items on display at Lár na Páirce. This entry was posted in Uncategorized by adminGAA. Bookmark the permalink.